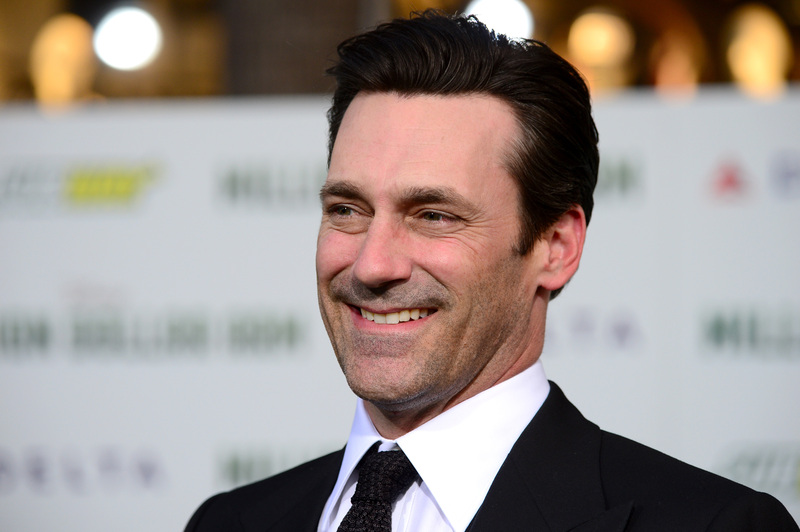 FINALLY, Jon Hamm is coming back to Parks and Recreation next season! I mean, so are former regulars Rashida Jones and Rob Lowe, but who CARES, right? When Hamm appeared in a millisecond cameo in last season finale as the alleged worst-employee-ever Ed, my heart nearly burst out of my chest. After all, the only thing better than tuning in to the predictably dashing Don week after week is an out-of-the-blue, totally unexpected Hamm appearance. Why? Well, let's not mince words: he is DREAMY. Like, next level dreamy. Like, sometimes my mom and I go out to Friendly's, order ice cream sundaes, and talk about how dreamy he is. And that aside, underneath the mask of Don Draper he has such a fun-loving, jovial presence. Hamm is up for anything, so naturally he randomly appears EVERYWHERE. It could be anything from a cameo in the A-Team movie or a old guest star spot you catch while binge-watching Ally McBeal, or a video of him on Sesame Street that appeared in your newsfeed (because I'm assuming you don't watch Sesame Street anymore). No matter what, it's always a treat to see him pop up. And did I mention he's dreamy? Anyway, to further prove my point, here's just a few examples of times when our lives were elevated by a Jon Hamm appearance. I've mentioned this is previous posts, but to recap, I'm currently cycling through Gilmore Girls for the very first time and when a young Hamm showed up briefly in the middle of season three. Lorelai goes on one uneventful date with him and then dumps him for being boring but COME ON. He's so hot! And he had Bowie tickets! His recurring role as Liz's wildly dumb hook-handed ex was a delight in itself, but there were other special times when his essence brightened up the series. Yes, even in the live episode's side-eye worthy racist NBC show cutaway. Rihanna is there too, but that's secondary. You're going to have to watch the entire video to appreciate the moment, but it's worth it. Actually this one's a bit cringe-worthy and it's not like any of us would've appreciate this in 1996 (I, for example was 5-years-old back then. Still, it's just comforting to know that even the hot ones have awkward phases. Jimmy Fallon needs members for the Glee club, and Betty White is teaching Hamm some sweet moves. It only gets better from there. He's hosted a handful of times, but I love it when they bring him in for funnies. My personal favorite being the time when Lindsay Lohan hosted and they had him in the wings if anything goes wrong. "No, Lindsay, I'm sure you're gonna be just great." A blessing from the Hamm, what could be better?